I love fall! Butterflies are abundant this time of year. Monarchs are migrating south. Autumn leaves are starting to show their crimson, orange and golden colors. And, then there are pumpkins! 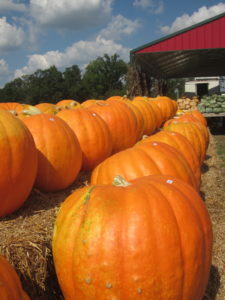 Pumpkins all lined up and ready to be taken home to carve. 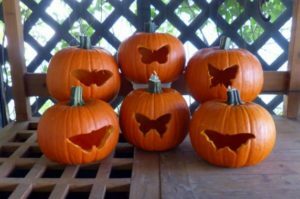 Here are a few ideas on how you can celebrate this wonderful time of year with butterflies and pumpkins. 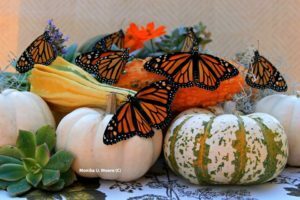 Monika Moore, the California Butterfly Lady, always creates fun fall butterfly displays using Monarchs she’s raised. 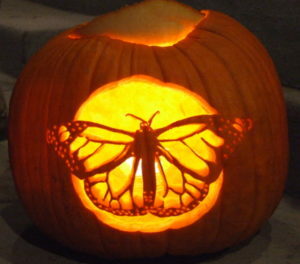 Like a moth to flame, this Monarch butterfly can’t get enough of Heather Ward‘s enchanted jack-o-lantern. This adorable little girl and her butterfly won the 2014 This Old House Pumpkin Carving Contest. 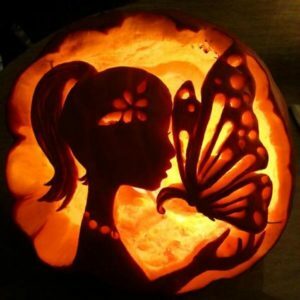 “Pumpkin carving of a girl with a butterfly. I used various size knives and drills for this project. Also used a few toothpicks to hold it in place.” Jina L. of Mississauga, Ontario. 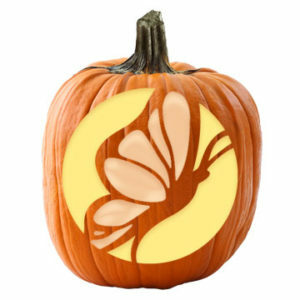 Need some help carving a butterfly? Download this free stencil with instructions from Better Homes and Gardens. Don’t feel like you are creative? Jill Staake of Birds and Blooms used metal butterfly-shaped cookie cutters and a rubber mallet to make these butterfly designs. She used smaller “pie pumpkins” to create this small collection. Hollow out each pumpkin as you would for traditional carving. Then, center a cookie cutter on one side and gently tap with the rubber mallet until the cookie cutter goes all the way through the flesh. Start in the center and work side-to-side to avoid bending the metal. Remove the cut pumpkin along with the cutter, and clean up the edges with a sharp paring knife. 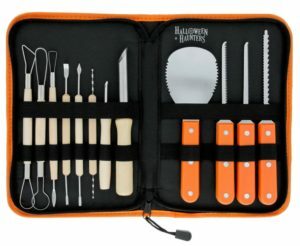 You might want to consider purchasing a Professional Pumpkin Carving Tool Kit to help you carve your pumpkins. If you raise Monarchs you know that this time of year there is always a shortage of milkweed to feed starving caterpillars. 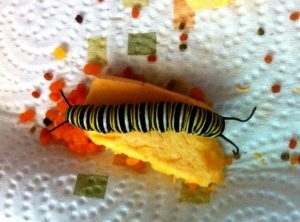 Did you know that you can feed 4th and 5th instar Monarch caterpillars fresh pumpkin? Monarch larva will eat pumpkin during their last stages. Notice the color of the frass is dark orange rather than dark green. When you are finished with your pumpkins, save the leftovers for your Monarch butterfly caterpillars. Halloween is just around the corner. Do you have your costume ready? 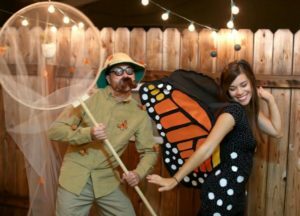 Here are some butterfly-themed costumes you might like. What an adorable idea for a couple! 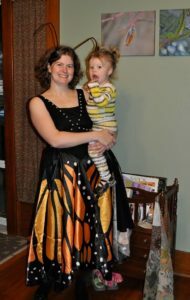 Julie Ann Art created this unique Monarch butterfly costume. Here is another cute duo. Katie Van Blaricum of Insect Art and her darling little caterpillar. 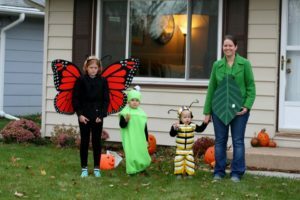 This family dressed up as the whole lifecycle of the Monarch butterfly. Aryn Bedrick made a costume for every member of the family to represent the four stages of a butterfly. Don’t you love this adorable little butterfly? 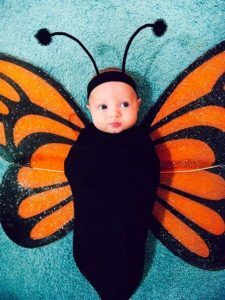 Check out these butterfly costumes for babies on Amazon. Click Here or on the photo. 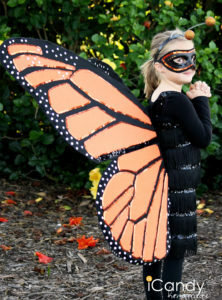 Here is an adorable DIY Monarch butterfly costume. Click here for instructions on how to make this costume. 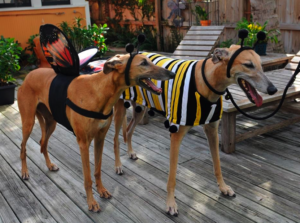 Don’t miss out on these butterfly costumes for doggies! Click Here or on the photo. Sometimes a child-created costume can be the best! 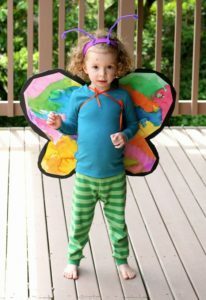 Click Here or on the photo to see how to make your own butterfly wings. 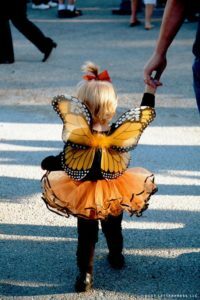 And if you are not creative and just too busy to make a butterfly costume, you can always find one online. Click here or the photo to find purchase this costume. Hoping to see lots of butterflies this Halloween! All across Canada, in the northeastern United States and in the Midwest, people have reported seeing scores of Painted Lady butterflies (Vanessa cardui). In fact, the National Weather Service posted an image of a bewildering blob this week of a great mass of colors spread across Denver and neighboring counties. Weather scientists weren’t sure what to make of it. At first, their best theory was that they were looking at birds. But it turns out that it was migrating Painted Lady butterflies. 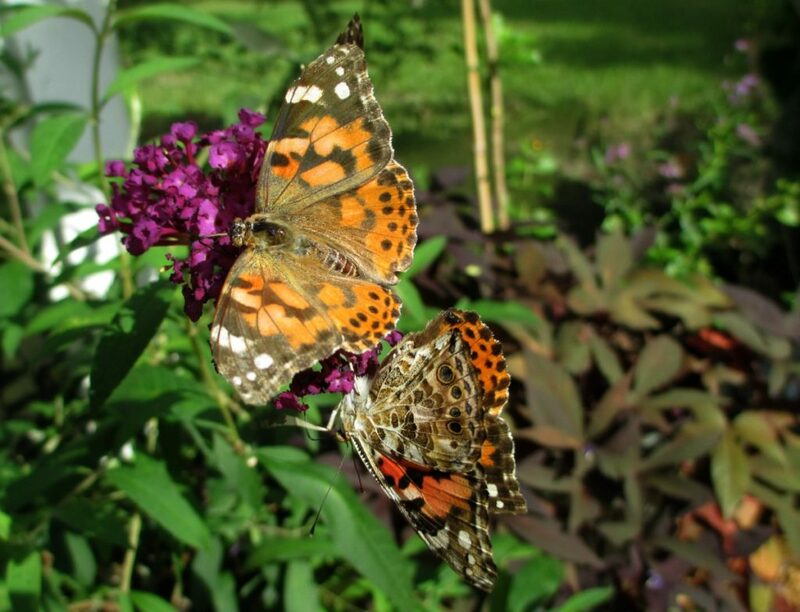 Painted Lady butterflies nectaring on Butterfly Bush (Buddleia spp.). 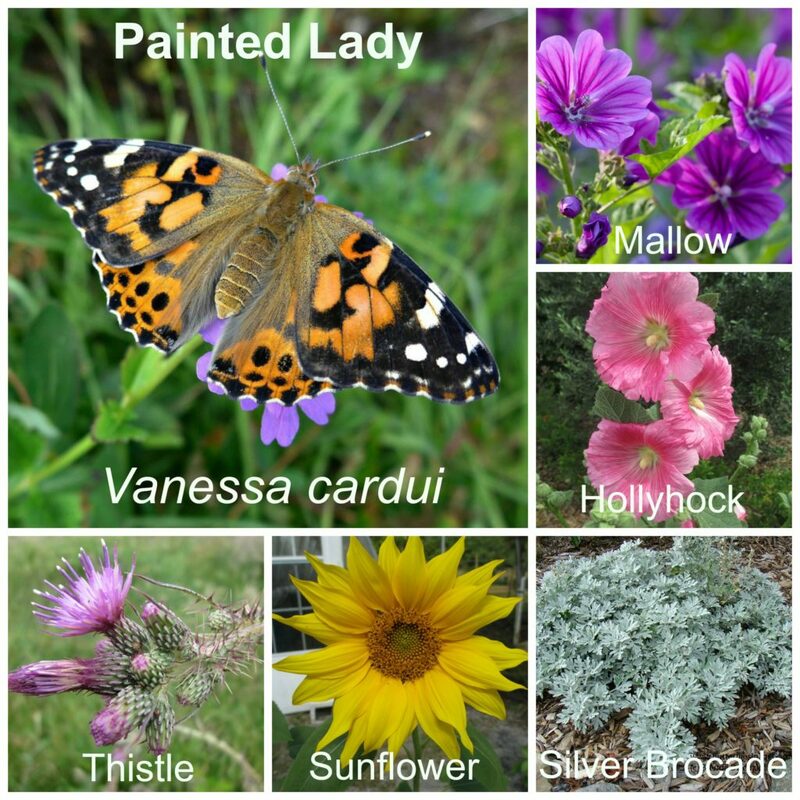 The Painted Lady is native throughout the United States. In fact, it is the most widely-distributed butterfly in the world. It is found throughout Europe, Asia, Africa, North America, and Central America. It is not a permanent resident in the eastern United States, but quasi-periodically migrates there from the deserts of the southwestern U.S. and northern Mexico. These migrations are sporadic, sometimes enormous, and often follow rainy periods in those deserts. Painted Lady larvae feed on a wide variety of host plants from the families Compositae (especially thistles), Boraginaceae, Malvaceae (especially the hollyhock Alcea rosea), common mallow (Malva neglecta), and a number of legumes including Iowa soybeans. The Painted Lady butterfly and some of its host plants. Some confuse these butterflies with the Monarch (Danaus plexippus). While their color scheme may be similar to Monarch butterflies, Painted Ladies have eyespots on the underside their wings in addition to brown coloring on both sides. Painted ladies lack the vein pattern that monarchs are best known for. Painted ladies are also smaller than Monarchs, with a wingspan measuring less than 3 inches. Dorsal and ventral views of the Painted Lady. Note the yellow-tipped knobs on their antennae. 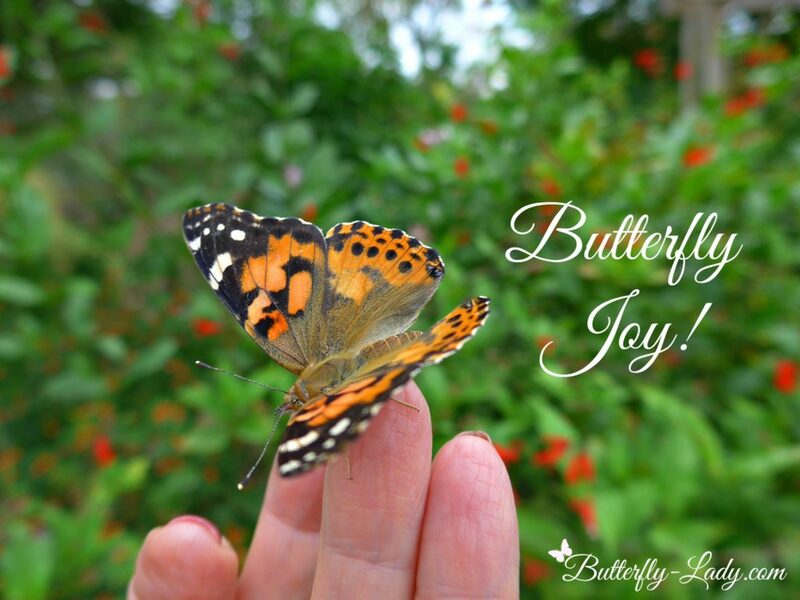 Thanks to favorable temperatures, there has been a huge influx of Painted Lady butterflies this fall. Some observers have spotted more than 100 in a single garden! 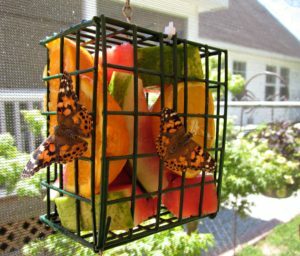 To attract these and other butterflies to your garden you can hang up fruit inside a suet feeder. A couple of Painted Lady butterflies enjoy sips of sweet fruit juice on a summer afternoon. • Click Here or on photo to view a variety of suet baskets.